Over the course of the last 25 years, the generosity of our donors allowed us to award $53.8 million in grants and scholarships. And we’re just getting started. Click on the boxes below for content. An office for Kevin Murphy (bottom left) was housed in the offices of the United Way of Berks County when the Community Foundation began. Kevin was a bit outnumbered by United Way staff. 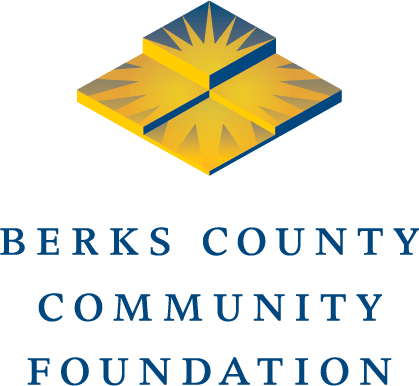 The Community Foundation staff created a fused glass artwork in 2018 to celebrate the fifth anniversary of the Berks Community Health Center, which was founded with help from the Community Foundation. From left to right: Vivi Anthony, Administrative Assistant; Monica Reyes, Health and Human Services Program Officer; Kevin K. Murphy, President; Heidi Williamson, Vice President for Programs and Initiatives; Eunis Domenech, Finance and Operations Administrator; Franki Aitken, Senior Vice President for Finance and Operations; Sally Cox (former Finance and Operations Administrator who accepted an opportunity elsewhere in 2018); Leta B. Doganes, Scholarship and Grant Administrator; June Clougher (former Director of Jump Start Incubator who retired in 2018); and Jason Brudereck, Director Of Communication. Seated: Franki Aitken, then-Director of Donor Services & Chief Financial Officer; Kevin K. Murphy, President. Standing: Melissa S. Hahn, Communications Manager; Donald van Roden, Board Chairman; Patricia C. Giles, Director of Grantmaking Services and Chief Program Officer; Kay A. Haring, Consulting Services Manager; and Leta B. Doganes, then-Assistant to the President. Every year, the Community Foundation holds a luncheon to honor our scholarship recipients and the donors who made those awards possible.